1 Warehouse + 150 Artists + 1 Beneficiary = Art Con 9! On November 9th, I joined 150+ artists in an urban warehouse on Singleton to create an original piece on an 18x18" plywood board. The chilly Fall air, limitless environment, and studious artists all around me immediately shifted me into high gear. Knowing that I was creating for such a worthy cause made the whole experience that much more fulfilling. The pieces would be auctioned off for charity in a high energy auction a week later. Creation day! This took me about 4 hours. Art Conspiracy, known for their street-level philanthropy, is a forerunner in the Dallas community. 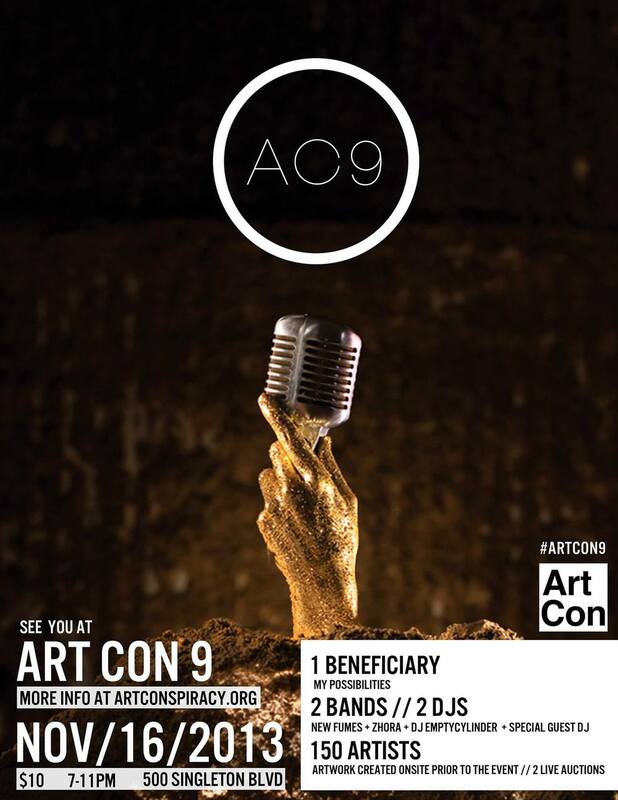 For the last 8 years, they've hosted Art Con, a high energy live art auction whose proceeds benefit a chosen local non-profit. This year's beneficiary was My Possibilities! My Possibilities is a 501(c)(3) non-profit organization serving adults with disabilities (including Autism, Down Syndrome, Aspergers, Prader-Willi, and head injuries). The organization is the first full day, full year continuing education program in DFW for Texans with disabilities that have “aged out” of secondary education, and is considered a leader in the local community and throughout North Texas for meeting the needs of adults with special needs. The pieces were auctioned off for charity in a high energy auction on November 16th. See my piece being auctioned off below! You can see the Dallas Observer's 11 Best Photos from Art Con 9 here. The whole experience was just as special as past participants had described. I hope to have the opportunity to do it all again next year!